Taking advantage of the starting order today, the third man out, Marc Coma, achieved a not inconsiderably splendid performance in the dunes at the end of the special stage to pick up his 5th stage victory of 2012. More importantly, the Catalan beat his main rival Cyril Despres by 3’57” and regained the lead in the general standings by 1’35”. In the car race, whilst American Robby Gordon picked up the gauntlet by winning his 2nd stage victory of 2012, the day especially saw a big fright for Stephane Peterhansel when he became stuck for several long minutes in the dunes, before finally conceding only 2’49” to Nani Roma, who he still leads by 20 minutes in the general standings. Assisted by the strategy used yesterday, which enabled him to start the day’s special in 3rd position, Marc Coma went on all out attack throughout the 197 kilometres of the timed section on the 12th stage, picking up his 21st stage victory on the Dakar. At the finishing line, the Spaniard beat his two countrymen, rally revelation Joan Barreda, 2nd 2’43” behind, and Jordi Viladoms, 3rd 3’10” behind. Handicapped by having to open the road, Cyril Despres tried everything to foil the Catalan’s strategy. 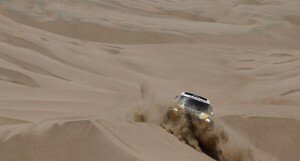 Risking everything, the Frenchman managed to only concede a little more than thirty seconds before getting to grips with the unstable dunes on the last part of the special stage. On this tricky terrain, despite the enjoyment he claimed, the man from Andorra could not prevent himself from losing time whilst opening the road, finally conceding 3’57” to his main rival. 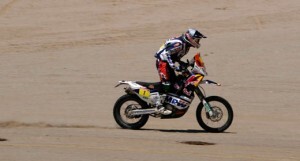 Two days from the finish in Lima, Coma has taken command of the general standings, 1’35” ahead of Despres, who nevertheless may have played a good strategic card, since he will have the advantage of starting in 4th position tomorrow, whilst his Catalan rival will have to open the road… Behind, the battle for the 3rd place on the podium is still close: Helder Rodrigues, 7th today 7’31” behind Coma, lost 4’21” to his main rival Jordi Viladoms, and now only has a lead of 26’45” over the 2nd Catalan in the Top 4. 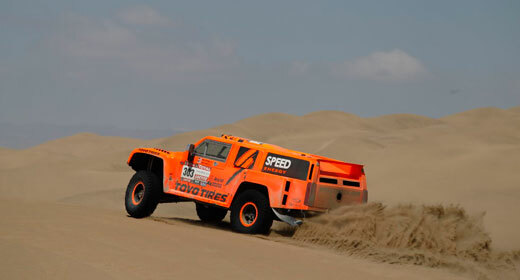 Whilst Gordon put on a show, “Peter” got a big fright… After losing 1 hour and 50 minutes due to a mechanical problem yesterday, Robby Gordon only has stage victories to look forward to as a consolation on the Dakar 2012. Twenty-second to start this morning, the American went on the attack from start to finish on the day’s special, annihilating the competition to pick up his 6th stage victory on the Dakar, 15’18” ahead of Russian Leonid Novitskiy, and 22’06” in front of South African Giniel De Villiers. Respectively 1st and 2nd to get to grips with the tracks this morning, Stephane Peterhansel and Nani Roma both came close to a major setback today when they both got stuck in the sand for a not inconsiderable time. Stephane Peterhansel seemed to fair worse, losing almost 20 minutes to get out of a “sink hole” between dunes after 145 km. However, he hurtled back into the race over “the 50 km where I’ve attacked the most during the whole rally” in his own words. The man from Vésul eventually caught up with his team-mate and nonetheless rival just before the finishing line to only concede 2’49” to Roma, the Catalan having also encountered the same sort of problems after 155 km, but taking less time to get over the mishap. Two days from the finish, in the general standings, Stephane Peterhansel therefore brilliantly limited the damage today and now has a lead of exactly 20 minutes over Nani Roma. Behind them, Giniel De Villiers still appears able to protect his 3rd place until Lima, but still has to steer clear of problems and keep a watchful eye on Robby Gordon in fourth who probably still has not given up hope of a podium finish, despite trailing the South African by 37’24”. 42 seconds separated the two Patronelli brothers on the finishing line in Nazca, but this time Marcos was king of the reduced pack of quads still in the race. After Alejandro on Thursday in Arequipa, the 2010 winner triumphed in a stage that was a carbon copy of the previous days’ scenarios. The two Patronellis and Maffei are singing from the same hymn sheet without worrying about the other competitors, who are struggling to get themselves noticed. In spite of the difficulties announced and encountered during the day, none of the leading trio faltered and the general standings, with gaps in the region of an hour separating the three men, seems almost set in stone with the perspective of an all Argentinean podium. 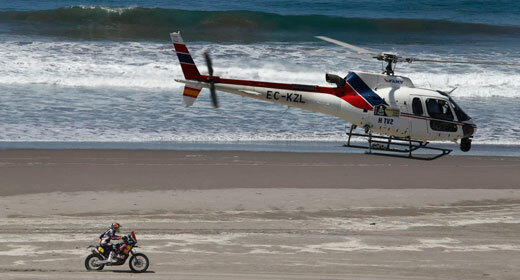 Lastly, in the truck category, Andrey Karginov experienced both sides of the Dakar within the space of 24 hours. After winning in Arequipa, he had to admit defeat on the sandy tracks leading to Nazca. Out in front, Gerard De Rooy was victorious, for the 5th time this year. As a result, he retains a solid lead in the general standings. The stage saw the Iveco machines walk away with the first four places on the special, with Hans Stacey and Miki Biasion unusually finishing on exactly the same time, both 32 seconds behind De Rooy! Whilst the first three positions in the general standings are unchanged (De Rooy, Stacey and Ardavichus), Frenchman Joseph Adua has taken advantage of Karginov’s mishaps to steal fifth place, a handful of minutes (22’03”) behind fourth-placed Ilgizar Mardeev, with perhaps the hope of placing a 3rd truck from Team De Rooy in the final Top 4.